It really can't be stressed enough, the Real-Money Auction House in Diablo III is a dangerous place. The South Korean Government did not prohibit the RMAH and ban all virtual-item trades for real-life money just because they wanted to be stuck-up douche bags, they did it to protect gamers from Blizzard. Consumer protection in the world of interactive entertainment is a laughable thing. No one cares because most people think, "Hey, it's a game. No harm, no foul." That is, until you lose $149.00 bidding on a glitched item in a Real-Money Auction House. This isn't the first report of RMAH woes tied to Diablo III. One of the more public cases was recently covered over at Forbes where a guy was denied $100 in a RMAH trade glitch, the issue was resolved but not before it went public and became a brewhaha. This latest case involves a fellow who claims he placed a bid on an item that was listed for $0.00. Quite naturally, one would assume that the next bid would be for maybe, $1.00? Maybe $2.00? Nope. According to this Battle.net user, he logged back into Diablo III to find that he purchased an item for a less than breezy $149.00. Yikes. After repeatedly calling support for help he later took to the forums to expose his circumstance. •	Items that were listed to sell on the AH pre-maintenance are no longer showing up under the Auctions tab. •	Items that were being bid on are not showing up under the Auctions tab. •	Items that have "disappeared" as a result of the above two issues -- they do not show up under Completed and players don't currently have the option to recover these items. A lot of people just don't seem to understand the dangers of a Real-Money Auction House. There are countless ways to lose money in this thing and there's also the risk of losing more than just what's in your Battle.net balance. This is the absolute definition of legalized interactive gambling, with the possibility of losing or gaining a modest $250 at a time. I spoke with Casey S, ticket number 28387111 (he put me on hold for liek 10 minutes), seemed like a decent guy, but his answer was completely crap. Basically he said they are completely hands off with the RMAH. He suggested that I put the item back up to try and make some money back. I politely argued with the guy for about 15 minutes, I know he can't do anything. But he literally told me that they are completely hands off with the AH, if there is a bug on their part they will not back anyone up. Blizzard has been dodging responsibility in this thing the entire way through. Fanboys don't make it any easier by constantly pointing fingers at consumers. I'd take this guy's case as a warning to completely stay away from the Real-Money Auction House. Diablo III may be a fun game but don't get caught in the addictive downward spiral of playing, getting stuck, buying high-level gear from the RMAH, playing some more, getting stuck and buying the next set of high-level gear from the RMAH. 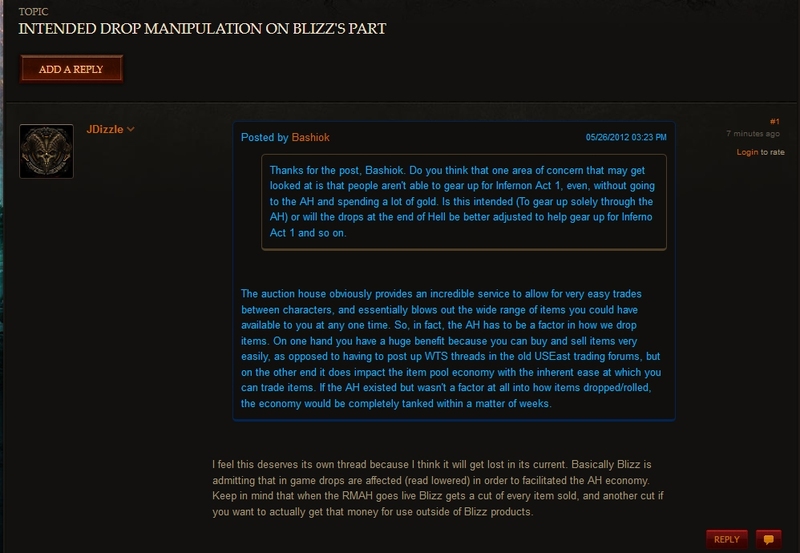 Take note that the above quote came directly from Bashiok, Blizzard's top game master. It's like admitting a company purposefully fluctuates the volume of their own stock on Wall Street to keep the prices sustainably high. It's not beating the system, it's controlling the system. Yeah, it makes that "sweat shop" analogy in that Extreme Tech article look all too real, eh? As usual, the guy who lost his $149.00 was met with a lot of hostility on the forums and some level headed individuals are suggesting he go to the FBI. Likewise, the opposite end of the factor is that people have concocted theories that this is part of the next step in the gold farmer/hacker scheme to scam people out of real-life money. If it happens on a virtual market place do the laws of grand theft still apply? A consumer watch dog group would probably really come in handy right about now. Take from this what you will, but in all honesty this is a clear sign to stay away from the Real-Money Auction House. I know it's tempting, but just pretend you're walking down The Strip in Las Vegas and you have to ignore all the casinos surrounding you. As a word of advice, if you've encountered any problems with the RMAH, it's highly advised that if your issue isn't resolved you should contact the Better Business Bureau, the FTC, your local FBI branch or a trusted member of the press to help expose the situation, otherwise Blizzard will keep steamrolling over your rights as a consumer.